Amateur radio has added yet another Tech to the fold. Danny is seen below being congratulated by fellow VE’s. 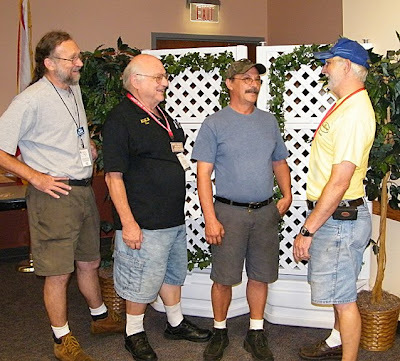 Left to right are Bill KJ4IAI, Jim AI4LE, our new Tech Danny, and Ernie KG4YNI. Also present was VE and club photog Bill KI4ZMV. It was obvious that Danny was well prepared for his Technician license test. Not only did he get nearly a perfect score, but he accomplished this in spite of the considerable QRM generated by a dozen or so XYL’s at the same QTH setting up for a quilting class.